Knight Signs was originally engaged to determine the structural condition of the existing sign. Our crew took an engineer up in our boom truck and removed sections of cladding, to reveal the structure beneath. It was determined that it would be safer, and in the long term, more cost effective, to replace the sign. The customer and the Heritage Group wanted the new sign to look like the existing sign did, when it was first created. With the help of an archival paint and materials analyst, we determined original colours. 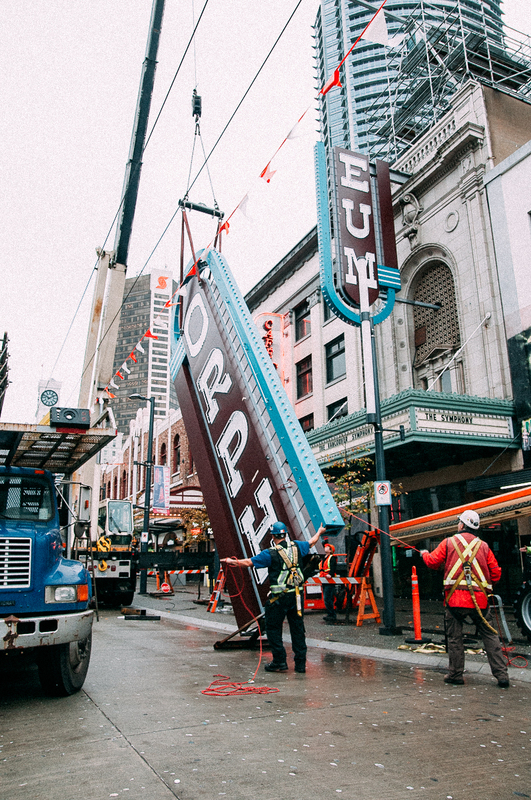 Once all approvals were in, we built the 49’10” x11’5” sign, in two pieces, assembling them on site, the day after removing the deteriorating old sign. While keeping the historical appearance of the sign, we improved the efficiency by replacing 260 @ 40W incandescent chasing light bulbs, with LED bulbs, drawings less than 1W each.